These are my peeps. I had fun taking pictures of them today in their Braves gear. They aren't very good pictures, but they were so cute together, laughing and joking. 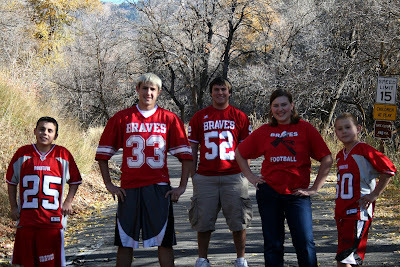 I'm going to be sad next year when I only have three Brave football players instead of four. Last night was the girl's choice Halloween dance at the high school. How cute are these? Evan and Maddie Cook dressed up as "hippies". So. Dang. Cute. 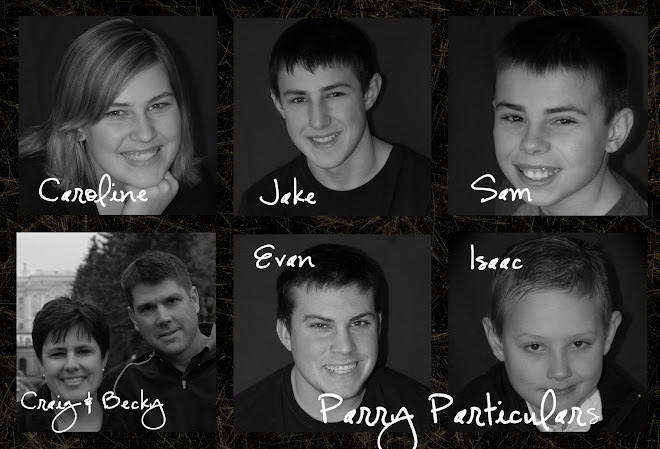 I love this picture of some of my boys. Evan is the hippie. Jake is the ghoul (he went stag--not 16 yet--and scared people in the haunted house area). Thomas is the gangsta. These guys almost made me wish I could do high school over again. Almost. They had a blast at the dance! Today I took Icky to the allergy doctor for his fish skin testing. It did not go well. He had immediate and decisive reactions to crab, shrimp and salmon. Salmon and shrimp are two of his favorite foods and we had high hopes that the skin testing would go well. For most of the 90 minutes we spent at Dr. Broadbent's office, silent and not-s0-silent tears continuously streamed down Isaac's face. This was the most emotional I have seen him. The saddest. The most discouraged. I was really sad today. Isaac was the only Parry this week who didn't play Viewmont. His team played Bingham at home (his only home game of the year). Even with the home crowd (including Evan and a bunch of brown kids from the high school football team) Isaac's team lost yet again. 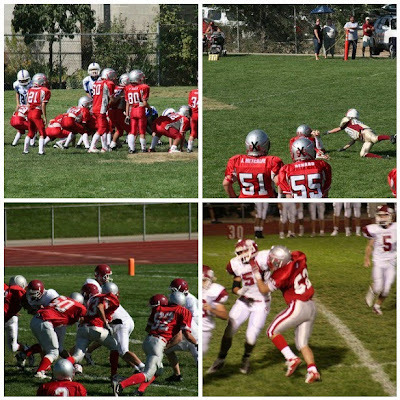 In fact, it really wasn't much of a game, the Miners beating the Braves 25-6. But Isaac played well, pictured here running "the hammer" where he wedge blocks up the middle and a running back runs behind him. It's usually good for a few yards. Sam's team, still undefeated, beat Viewmont 26-0. Sam's defensive secondary coverage was excellent. He's pictured here nearly intercepting the ball. The referee called it a trap, which Sam said was a good call. It's hard to see him in the picture, but he's diving onto the ground behind the two linemen on the sideline. Sam also ran the ball at wing. The sophomores went into this week's game against Viewmont with only one loss. It was a very exciting game and Jake played really well. With two seconds left in the game, the score was 14-14. Viewmont had the ball and attempted a 41-yard field goal, a vast distance in sophomore football. Unfortunately for the Braves, the ball only cleared the upright by a few inches and the clock ran out, ending the game at 17-13 for Viewmont. This picture is Jake blitzing. Evan has a few new special team starting positions this week and he met expectations, blocking kids out of bounds whenever he was in. The varsity game was also exciting, ending 24-21 for Bountiful, leaving them undefeated at 6-0. We lost two of our best running backs, Ben Lemon and TJ Farr, for a few weeks though with some tough games coming up. We have to win eight more games to take state. Go Braves. Next up for Jake & Evan: East.